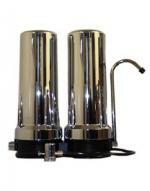 We are very proud to introduce the latest addition to the line of Chanson water ionziers. The MAX Royale is the undercounter version of the very popular MAX countertop ionizer. With its touchscreen controls and a very elegant stainless steel faucet, this ionizer will become a centerpiece in the design of your kitchen. Sign up for our newsletter to receive health tips, news updates and special offers. © 2019 Aqua Health Products Inc.